If only bubble tests were this harmless. This is the time to work for change in educational policies. This is the time to lay out a vision of education that is focused on each student becoming the person s/he wants to become, leading the life s/he wants to live, and creating a world s/he wants to embrace. On Dec. 17 at 1:30, parents, teachers, students and anyone else interested in making education more humane, will converge at Federal Plaza in Chicago. This plaza is in front of the building where President-elect Obama has his office. We will be sending a message up and out to his incoming administration, and to all interested in education, that it is time for a truly child-centered education that focuses on learning as a process. We will contrast what school is like with how it could be by using bubbles as a prop. We will blow soap bubbles to represent a naturally interesting way to involve students in the process of learning that is fun and collaborative. We are taking the bubbles back! When children at school think of bubbles, they shouldn’t think of filling them in with number two pencils. We must abandon the misguided attempts to break knowledge into discrete pieces that can be answered with number two pencils on a bubble test. 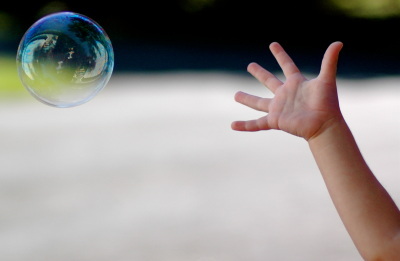 The current ideology that makes use of bubble tests dumbs down what is taught, limits creativity, encourages competition between students, penalizes students, teachers, and schools, and focuses onstudents’ “weaknesses” instead of their myriad strengths. You can’t measure creativity with bubbles. Which kind of bubbles do you think are best for eight-year-olds? We will tell stories and chart a vision of what education can be for all students. Dress warm. Bring friends, signs, and bubbles (keep them warm too). Subscribe to comments with RSS or TrackBack to 'We’re taking back the bubbles! '.